Dr. McGahan is Professor and Vice Chair, Department of Radiology, and Dr. Lamba is Assistant Professor, Department of Radiology, University oCalifornia, Davis Medical Center, Sacramento, CA; Dr. Coakley is a Professor of Radiology and Biomedical Imaging, and Urology, in thDepartment of Radiology and Biomedical Imaging, University of California San Francisco, San Francisco, CA. Acute abdominal pain in pregnant patients remains a diagnostic dilemma because of a multitude of factors. First, some of the clinical signs and symptoms of certain entities, such as acute appendicitis are less apparent in the pregnant patient as compared with the nonpregnant patient. 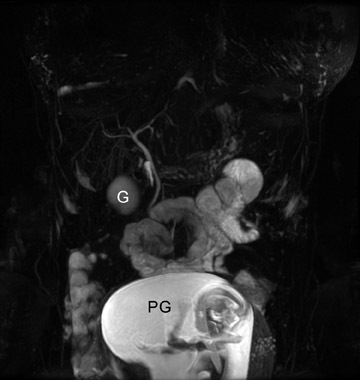 Second, some locations of anatomical structure, such as the cecum or appendix, may be distorted during pregnancy, making diagnosis and imaging difficult. Finally, imaging of the pregnant patient requires consideration of 2 patients: the mother and fetus. 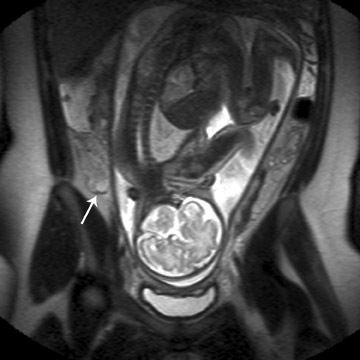 The choices for imaging the acute pregnant abdomen can include plain radiographs, ultrasound, non-contrast computed tomography (CT), contrast-enhanced CT, non-contrast magnetic resonance imaging (MRI) and contrast-enhanced MRI. For the most part, excretory urography and barium gastrointestinal studies are rarely, if ever, utilized. 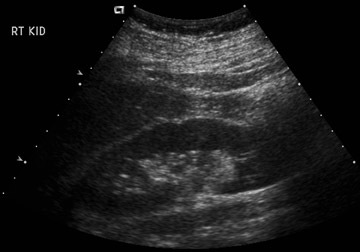 The American College of Radiology (ACR) recommends that when performing imaging for evaluation of the pregnant woman, nonionizing techniques, such as sonography and MRI should be used as the first choice.1,2 As the precise clinical etiology of abdominal pain is usually not known, there would be little argument against use of sonography in any pregnant patient with abdominal pain (Figure 1). For instance, while acute appendicitis may be clinically suspected, ovarian torsion may be detected. 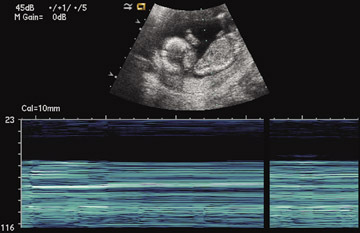 While ultrasound may be more sensitive to the patient in the first trimester, the use of ultrasound in the second and third trimesters may have less sensitivity in detection of certain conditions. In all cases, sonography should be used to document fetal viability or any pregancy complications. MRI, like ultrasound, does not use ionizing radiation. However, unlike ultrasound, scanning with MRI is more complex due to several factors: greater exam time, patient claustrophobia, patient transport and limited after-hours access. Nevertheless, MRI utilization has been increasing in the evaluation of non-obstetrical emergencies. 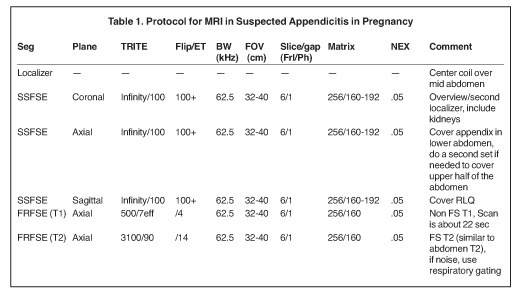 In pregnant patients, general MRI protocols include an MRI localizer, followed by T2-weighted (T2W) single shot fast spin echo (SSFSE) multiplanar images, and multislice spoiled gradient echo techniques (Table 1). There is increased concern about the utilization of ionizing radiation from CT and the associated, increased risk of cancer. This postulated risk is based on estimates derived from mathematical models and not on epidemiologic proof. The risk of developing leukemia is thought to be dose dependent and is greatest in younger patients. Also, the radiation dose from multidector CT protocols has been reported to be greater than single detector CT scanners.5 However, with further engineering, the geometric efficiency of >64 detector array CT scanners has approached that of single slice CT. 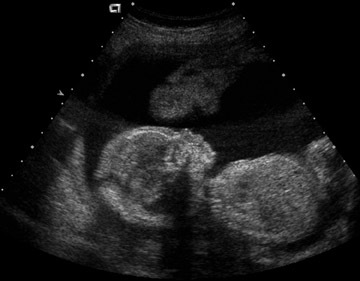 While teratogenic effects are believed to be minimal, there is a less well-defined increased risk of developing cancer that may be above the normal background risk.6 The risk of cancer as a result of diagnostic levels of ionizing radiation on the developing fetus are unknown, but it remains prudent to minimize exposure of ionizing radiation on the developing fetus. This is important for the first trimester, during which organogenesis occurs. Minimizing fetal radiation exposure can be accomplished by modifying CT protocols, e.g. performing a single-phase CT, instead of multiphase CT, could reduce the dose proportionately. Decreasing the tube milli-Amperage will help with dose reduction — changing tube current from 340 mA to 160 mA, would reduce the effective radiation dose one-third.6 Radiation dose reduction should be attained without deterioration in the quality of the exam. Finally, it is possible to limit the amount of fetal exposure by limiting the field of view. 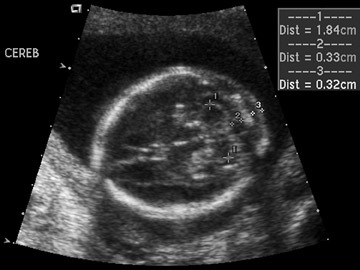 Radiation to the fetus from a CT of the maternal liver is primarily from Compton scatter rather than direct exposure obtained from CT of the pregnant uterus. The fact remains: CT provides life-saving diagnostic information when used for appropriate clinical indication. Radiation dose reduction, although prudent when appropriate, must not compromise the diagnostic outcome of a clinically relevant examination. This review will concentrate on only the most common etiologies of pain in pregnant patients. 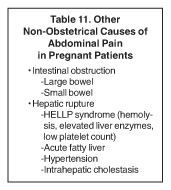 A partial list of non-obstetrical causes of abdominal pain in the pregnant patient is listed in Table 4. While often not considered, trauma tends to be the most common etiology of non-obstetrical abdominal pain in a pregnant patient. Approximately 6% to 7% of pregnant patients sustain abdominal trauma. While motor vehicle accidents are the most common etiology, pregnant patients can also be assaulted, may fall or suffer auto vs. pedestrian accidents. 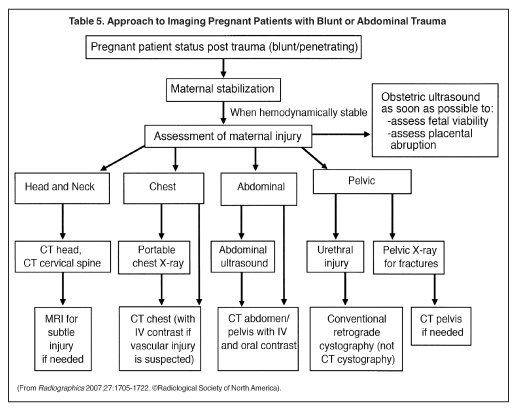 Trauma in the pregnant patient is one indication for contrast-enhanced CT in pregnancy. Certainly, the radiation dose for head, neck and chest CT is minimal to the fetus. In considering abdominal CT in the trauma patient, the acuity and gravidity of the suspected injury usually would be of greater concern than potential radiation dose damage to the fetus. 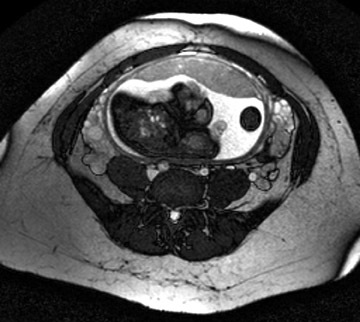 If CT of the abdomen is necessary, a single-phase contrast-enhanced CT should be used. Acute appendicitis is the most common cause of non-traumatic acute abdominal pain in pregnancy and accounts for ≤25% of operative indications for non-obstetrical emergencies. 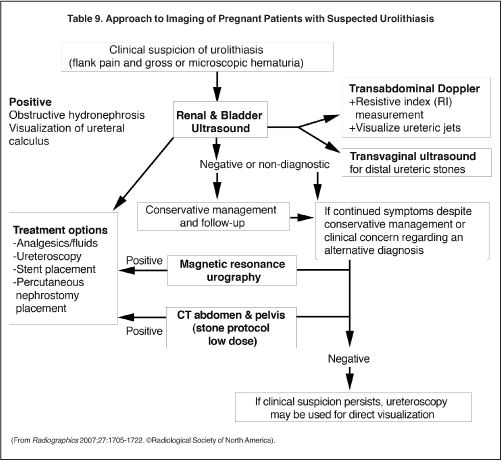 Ultrasound should be used as the first imaging choice in the pregnant patient with right lower quadrant pain (Table 6). The diagnosis of acute appendicitis by sonography is easier in the first trimester than in later pregnancy. The sensitivity of sonography in the pregnant patient has been reported to be between 66% and 100%. 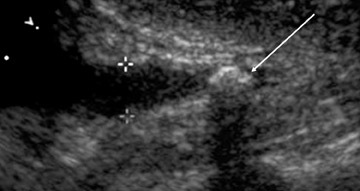 This depends on the sonographic expertise at the particular institution.9,10 In patients with right lower quadrant pain, sonography may be used for suspected appendicitis, but may instead detect other etiologies of pain, such as ovarian torsion. Findings of acute appendicitis are listed in Table 7 and illustrated in Figure 3. 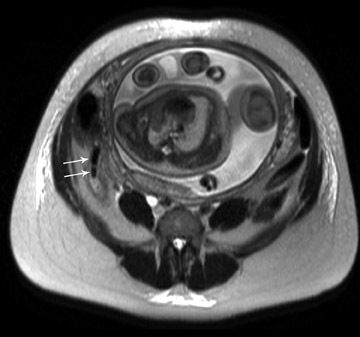 MRI is increasingly being used for diagnosis of acute appendicitis, especially in the second and third trimester. MRI should be used for failed diagnosis with sonography. Both T1W and T2W sequences are performed. 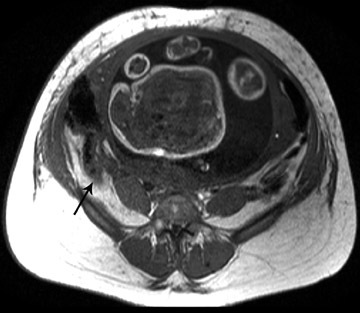 MRI may demonstrate the thickened appendix and associated periappendiceal inflammatory changes. 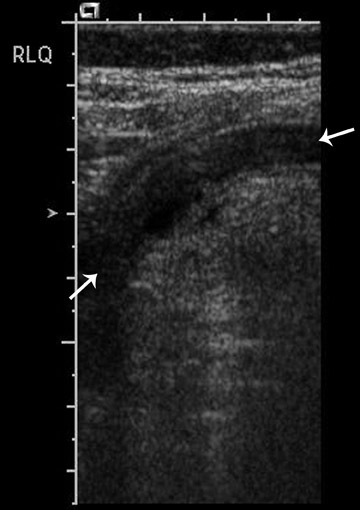 The inflamed appendical wall appears hypointense on T1W and hyperintense on T2W images. 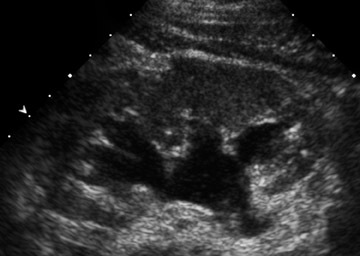 The fluid-filled appendix is seen as hyperintense on T2W images and edematous high signal intensity T2W changes can be seen in the mesentery (Figure 4). In patients where MRI is inconclusive, or in whom MRI cannot be performed, CT can be used, if the diagnosis cannot be made clinically. 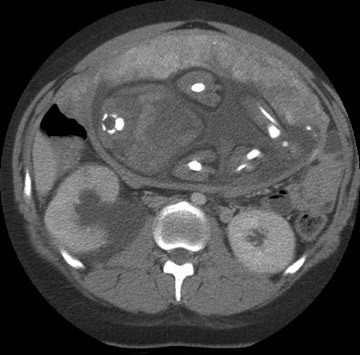 CT has high sensitivity in diagnosing appendicitis and the risk of delayed diagnosis with possible perforation may outweigh the potential risk of perceived radiation-induced risks. There should be use of CT with efforts to reduce the dose. 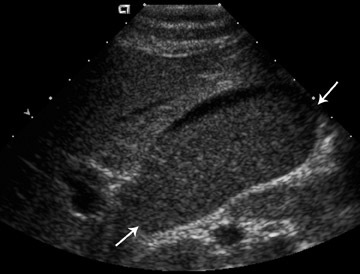 Acute cholecystitis is the second most-common cause of the non-traumatic acute abdomen during pregnancy. 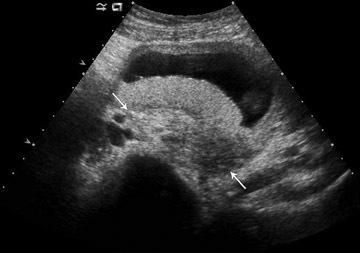 Acute cholecystitis is secondary to cholelithiasis. Estrogen increases bile lithogenicity during pregnancy and increases the risk of cholelithiasis and acute cholecystitis. Two other consequences of cholelithiasis are choledocholithiasis and biliary (gallstone) pancreatitis. Depending on the patient’s symptoms, magnetic resonance cholangiopancreatography (MRCP) may be useful to detect bile duct stones. Endoscopic retrograde cholangiopancreatography (ERCP) is usually guided by fluoroscopy, however, endoscopic ultrasound has been used to guide removal of bile duct stones. 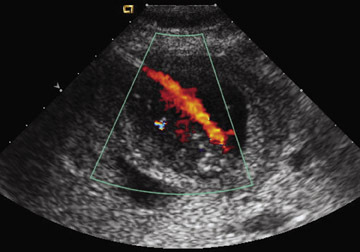 Cases of pancreatitis during pregnancy are more complex to manage and image. 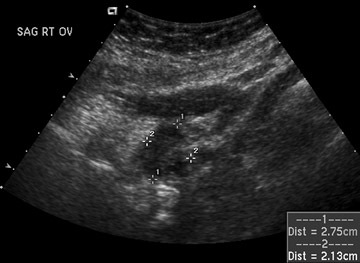 Ultrasound can diagnose some of the complications of pancreatitis such as fluid collection or pseudocysts. However, in rare cases where the maternal life is in danger, contrast-enhanced CT may be considered. MRI can be used to detect choledocholithiasis, if ultrasound is non-diagnostic. Without proper diagnostic information, pancreatitis and its complications may cause either maternal or fetal morbidity or mortality. 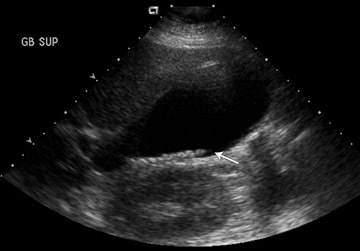 Urolithiasis is the most common etiology of non-traumatic pain in the pregnant patient that results in hospitalization. 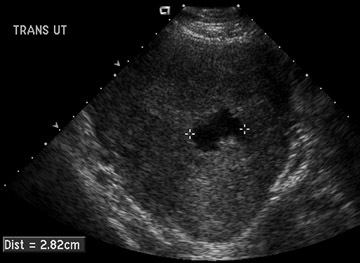 Seventy percent to 80% of ureteral calculi in pregnant patients pass spontaneously. However, renal obstruction can result in pyelonephritis or pyonephrosis and premature labor. Ultrasound is the first imaging procedure used to check not only for hydronephosis, but also for other etiologies that may cause abdominal pain (Table 9). 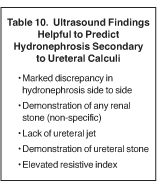 Ultrasound is quite good for detecting hydronephrosis. 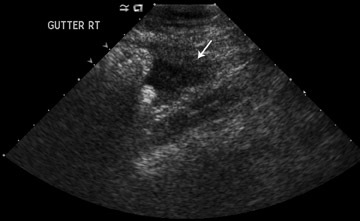 However, it may be difficult to differentiate physiologic hydronephrosis of pregnancy and hydronephrosis secondary to a stone. MR urography should be used as a secondary test when ultrasound fails to establish a diagnosis of hydronephrosis secondary to stone disease. 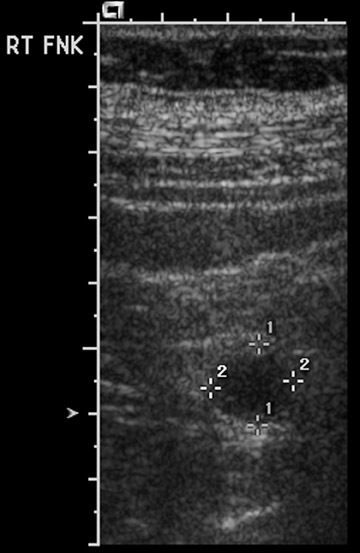 MR urography in physiological hydronephrosis shows tapering in the mid portion, due to compression between the uterus and the psoas muscle. 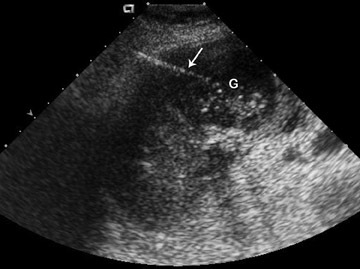 With stone disease, MR urography shows renal enlargement and edema, peri-renal fluid and the possibility of intraluminal filling defect (Figure 9). 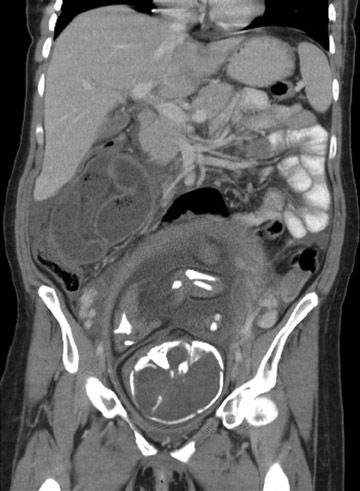 If all else fails, then a non-contrast CT can be used. CT has a high sensitivity and specificity for the diagnosis of nephrolithiasis and ureterolithiasis. 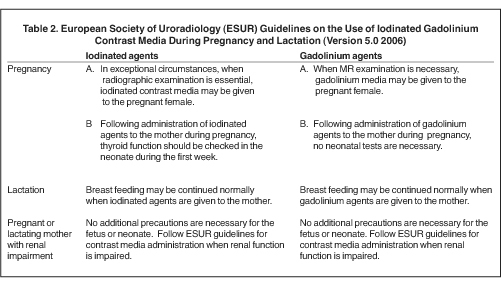 It has been shown in multiple studies that reasonable reductions in mA do not impair evaluation for urolithiasis and this should be employed for the pregnant patient (Figure 10). There are a number of different etiologies of abdominal pain in pregnant patients that have not been addressed in this article. Some of those etiologies are considered in Tables 9 and 11 and demonstrated in Figures 11 and 12. Acute abdominal pain in the pregnant patient remains a diagnostic dilemma because of the multitude of factors addressed above. 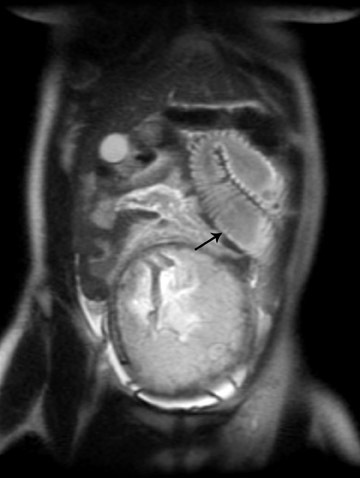 With a variety of imaging tools available, this review, and the included tables and figures, are intended to inform the clinical decision making regarding imaging options that are considerate of both patients: The mother and fetus. Ralls PW, Balfe DM, Bree RL, et al.Evaluation of acute right lower quadrant pain.In: ACR appropriateness criteria. Reston, VA: American College of Radiology, 1999:1-8. 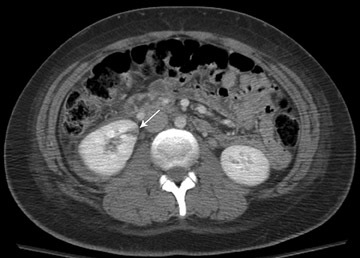 Rosenfield AT, Newhouse JH, Bluth EI, et al.Acute onset flank pain, suspicion of stone disease. In: ACR appropriateness criteria. Reston, VA: American College of Radiology,1998:1-3. Meadows M. Pregnancy and the drug dilemma.FDA Consum. 2001;35:16-20. Jaffe TA, Miller CM, Merkle EM.Practice patterns in imaging of the pregnant patient with abdominal pain: A survey of academic centers.AJR Am J Roentgenol.2007;189:1128-1134. Thomton FJ, Paulson EK, Yoshizumi TT, et al. Single versus multi-detector row CT: Comparison of radiation doses and dose profiles.Acad Radiol. 2003;10:379-385. Hurwitz LM, Yoshizumi T, Reiman RE, et al. Radiation dose to the fetus from body MDCT during early gestation.AJR Am J Roentgenol. 2006;186:871-876. Patel SJ, Reede DL, Katz DS, et al. 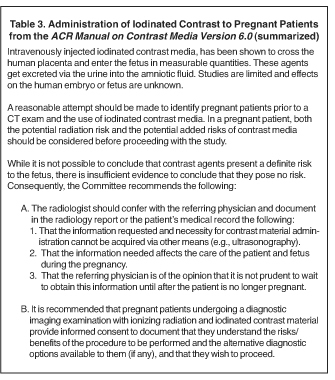 Imaging the pregnant patient for nonobstetric conditions: Algorithms and radiation dose considerations.Radiographics. 2007;27:1705-1722. Richards JR, Ormsby EL, Romo MV, et al. 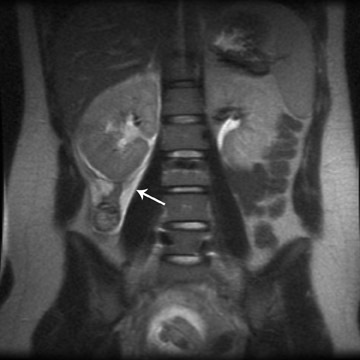 Blunt abdominal injury in the pregnant patient: Detection with US.Radiology. 2004;233:463-470. Barloon TJ, Brown BP, Abu-Yousef MM, et al. 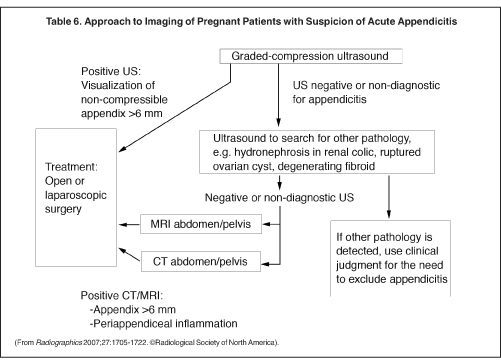 Sonography of acute appendicitis in pregnancy.Abdom Imaging. 1995;20:149-151. 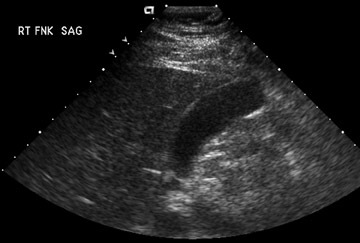 Lim HK, Bae SH, Seo GS.Diagnosis of acute appendicitis in pregnant women: Value of sonography.AJR Am J Roentgenol. 1992;159:539-542. Ginier B, McGahan JP. Percutaneous cholecystostomy for management of acute cholecystis in pregnancy.J Interv Radiol. 1992;7:87-89. Shokeir AA, Mahran MR, Abdulmaaboud M.Renal colic in pregnant women: Role of renal resistive index. Urology. 2000;55:344-347. 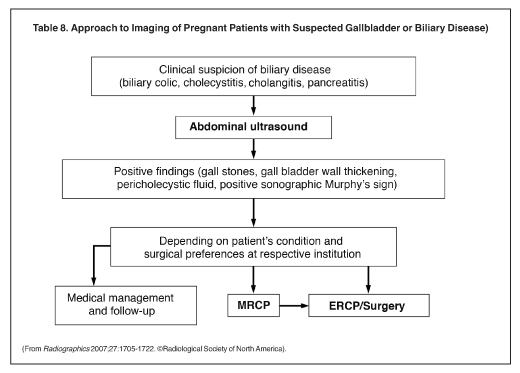 Imaging non-obstetrical causes of abdominal pain in the pregnant patient. Appl Radiol.